What is the difference between manual watches and automatic watches? Mechanical watches are marvels comprised of springs, components, gears and screws which all work together to tell time. At one point in history, all watches were mechanical and required manual winding in order to be powered. These watches were typically wound via the crown, which in turn tightens the mainspring inside the watch. The mainspring is the power source of all mechanical watches. Once wound, through a series of components and gears known as an escapement, the mainspring's tension is incrementally released which powers the watch. 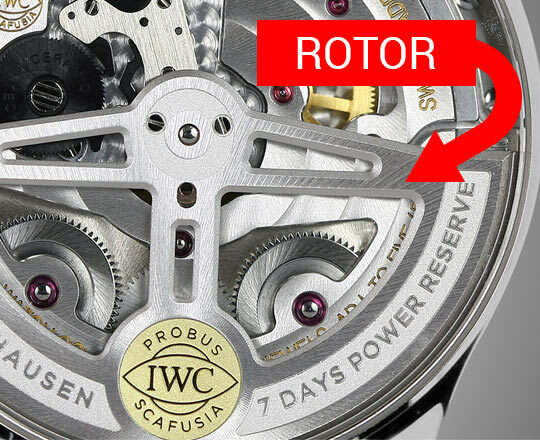 What makes an automatic watch (also known as a self-wind watch) different is that it has a weighted rotor mounted to the back of the watch's movement. The rotor is usually shaped in a semi-circle and is connected to the mainspring via a series of gears. With the motion of your wrist, the rotor spins on an axle and in doing so, winds the mainspring which in turn powers your watch. What is a Power Reserve? The power reserve is the amount of time it takes for a fully wound watch to unwind when not worn. Most mechanical watches have a power reserve of between 36 and 42 hours. This means that the watch can run for that duration on a full wind. Please refer to the manufacturer's product specifications to familiarize yourself with what duration you can expect from your watch's power reserve. Do automatic watches need to be manually wound? Yes, they do. Picture the mainspring inside a watch. When you first get an automatic watch, the spring is completely unwound. Moving the watch around will cause the rotor to spin, which in turn will begin winding the mainspring. While this will get the watch running it will not be enough to fully tighten the mainspring which would let you take advantage of the power reserve to its fullest capacity. It is therefore important to first wind the crown about 30-40 times which is enough to completely wind the mainspring on most watches. Once the mainspring has been fully wound, and the watch is worn on an active wrist, the rotor will do its job by continuously winding the mainspring thereby topping off the watch's power reserve. There is a common misconception that an automatic watch never needs to be wound. It's a mistake to think that a watch that has wound down or that is close to the end of its power reserve just needs to be worn for a while to wind itself up. While this may give you just enough power to keep the watch running in the here and now, and it may even run for a little while afterwards when it's not worn, it may not have had the chance to fully wind the mainspring and you'll experience a shorter power reserve, once the watch is removed from your wrist. People who are not very active like those who sit at a computer for many hours a day don't always move their wrists enough to fully wind a watch in which case they may need to give it a boost every so often by winding the crown about 30 -40 times. Can an automatic watch be overwound? No. Automatic watches have a mechanism in the movement that disengages the winding gears from the mainspring once it is fully wound. How do you wind an automatic Watch? A watch is wound via its crown, usually clockwise. Keep the crown in its pushed-in position and wind the crown clockwise. 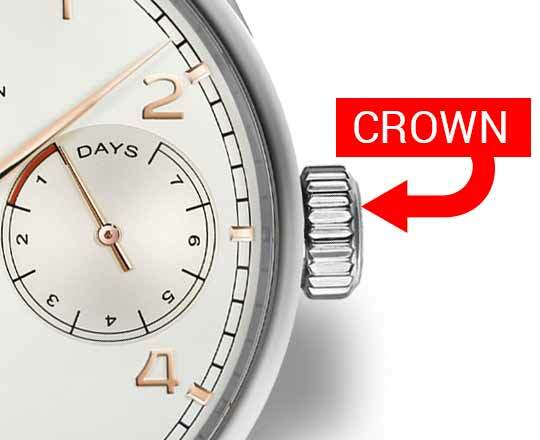 If your watch has a screw-down crown, you first need to unscrew the crown before winding. Another way to keep your automatic watch fully wound is by using a winder. A watch winder is a device that you mount your watch on for times when you are not wearing it. A winder moves the watch around mimicking the movements of a wrist. This is especially convenient if you own more than one automatic watch or have a watch with a high complication such as a perpetual calendar which is more complicated and takes extra time to set.